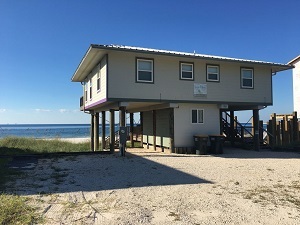 Lost Palms condo, beach resort home in Gulf Shores. Gorgeous beach front property in the upscale Surfside subdivision. This Non-Smoking, pet-friendly home is 2 bedroom/ 2 bathrooms with new mattresses on all beds including sleeper sofa. A fully furnished kitchen (except for your food). A lower and upper deck provides beautiful views of the Gulf. Swimming, boating, fishing, walking along the beach, shell collecting, and dolphin-watching are just a few of the wonderful activities you can do here. Lost Palms Condo Rental in Gulf Shores AL.